Benedict owns a gem stone shop in England. His life is quite complacent; business is slow and he is estranged from his wife and brother. Everything changes when Gemma, his niece from America, arrives on his doorstep. As the story progresses, there are frequent references to gem stones, their meanings and how they influence the story, such as how rose quartz means love, peace and appreciation. 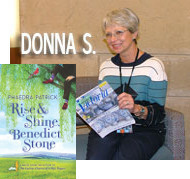 Try Rise & Shine Benedict Stone by Paedra Patrick for a charming, uplifting story.